American choreographer and creative consultant Stephen Galloway was a principal dancer and head costume designer of William Forsythe’s Ballet Frankfurt. His many collaborations with Forsythe include designing the costumes for The Vertiginous Thrill of Exactitude, part of The Royal Ballet’s repertory since 1999. Galloway was born in Erie, Pennsylvania. 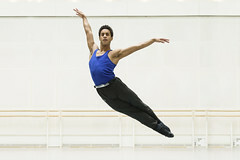 He joined Ballet Frankfurt aged 17 and retired from the company nearly twenty years later, in 2004. While with the company he also collaborated with Jan Fabre, Christian Moeller and Jan Lauwers of Needcompany, among others. He was appointed Ballet Frankfurt’s head costume designer and style coordinator in 2000, and his designs are featured in the productions of such companies as the Mariinsky, American Ballet Theatre, Paris Opera Ballet, La Scala, Milan, Scottish Ballet and Finnish National Ballet. He works extensively in fashion, renowned in particular for his close partnership with fashion photographers Inez Van Lamsweerde and Vinoodh Matadin. He has staged fashion shows for labels including Yves Saint Laurent, Costume National, Versace and Issey Miyake, where he was creative director 1993–7. He has also worked as a consultant for brands including Mercedes-Benz and Saab, and edits the quarterly magazine BRAVE!. Galloway has released two albums, From This Day On (2002) and The Return of Lubrious (2009). He has worked as a creative consultant to Mick Jagger and The Rolling Stones since 1997, including on their world tours Bridges of Babylon and Bigger Bang.